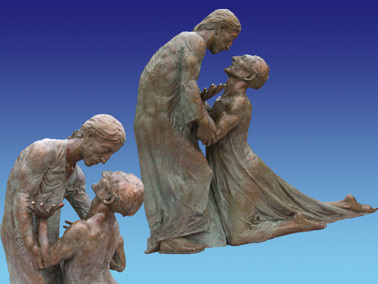 This work expresses the power of mercy, compassion and healing. It expresses the healing power of Jesus as He beckons a downtrodden to rise to his feet and be whole. It is a story told by Jesus of a Samaritan who gave mercy to a man who had been beaten, robbed and forgotten. The Samaritan stopped, gave the man medical attention and lodged him during his recovery.